It’s a well known fact that nearly all Sprint Cup drivers use private planes to travel between races, and it’s something that tends to catch the attention of fans and the media from time to time, usually in a negative way. I understand why. Years ago, if someone had told me they were flying places in a private plane, that would have sounded like an extreme luxury. And to an extent — namely, when it comes to missing all the headaches of a commercial airport like security and airline issues — it is. But using private air travel is really something of a necessity in our sport. A lot of people don’t understand that, so I’d like to kind of talk about why we travel the way we do, and some of the history behind it. My grandfather was one of the early participants when NASCAR first started, and back then, they raced 70 to 100 times a year. Until the 1970s, that was the norm, and then the modern schedule came out, which cut the number of races down to the 30s. That change was made for a number of reasons, but perhaps the biggest one was that logistically, it was impossible to make all the races back then. With 70-some odd races across the entire United States, there were only a handful of teams had the money to travel back and forth. And sometimes, even they would break down on the way to the racetrack, and actually miss the race because they couldn’t get there. Think of that if you’re a fan. You head to Arkansas to watch a race, and the guy you wanted to see — who was driving from Washington — broke down halfway. You bought a ticket, and he’s not there. That was kind of a tough situation to be in, and it happened a fair amount of the time. That’s part of the reason that we evolved to have two and three day practice schedules at most tracks. If you had an issue when you were traveling, you might still make it in time for the race. But as the sport developed and went into the modern area, with less races on the schedule and perhaps more of a focused approach, it freed up time for the teams to be able to travel. In that sense, there was never a reason to not be there for the race, or there should have been plenty of time to get there. Well, as we got into the era of the sport relying so heavily on corporate funding, there were suddenly new obligations for drivers. It wasn’t just about making it to races. It was about making it to four different appearances before each race, with all four appearances in different states. Just recently, I actually had to fly to six different states in six days, all for commitments that required me to be perfectly on time, without the slightest hiccup in the schedule. Imagine if I missed one of those appearances. There would be a lot of very disappointed people, much like those people who would have been disappointed in the 50s and 60s when their favorite race car driver didn’t show up at the race. Missing an event is really not an option, and commercial travel just isn’t reliable enough to actually keep that kind of schedule. 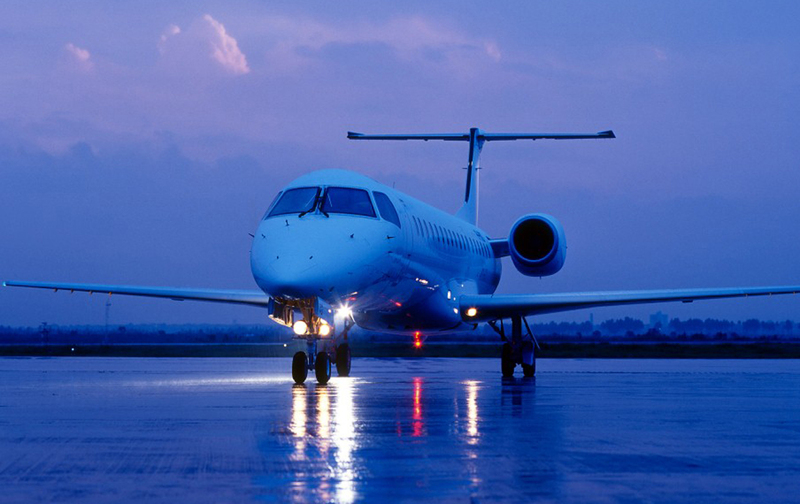 When it comes to using private planes, the truth is that we use an airplane like most people would use a car. Every once and a while, we take vacations with it, but mostly we use it to drive back and forth to work. I can really appreciate how much easier our plane makes things because of my background. When I was growing up, my dad raced all over the country. We would travel to a racetrack — from Michigan to Daytona, let’s say, which is a 24-hour drive — and we would just do it. I would ride in the car or the hauler or whatever, and sleep, or play video games, whatever you do as a kid. We would get to Daytona, spend three days there, and drive back. It would take us a day and a half to get there, and a day and a half to get back. By the time the week was over, we’d have spent nearly three days of cumulative time traveling. Compare that to the first flight I ever took. It was with Dale Jr., and I was just a Nationwide driver at the time. He had a very busy schedule and we both had an appearance in Florida for the Navy, who sponsored both of our cars, so he asked if I wanted to fly with him. I figured why not. The moment I stepped on the plane, I was a little nervous about it. The first thing I noticed was that the plane was really, really small. There was a lot less headroom than I was used to. I’m also not the best flier in the world, and I really don’t like not being in control. (Neither do most drivers, which is why a bunch of them fly their own planes.) But by the time we got to Florida, which didn’t take long, I’d kind of forgotten about all that. I’m still not the best flier in the world, and I’m very aware of NASCAR’s history when it comes to aviation accidents. In 1993, there were two devastating small plane crashes. One was with Alan Kulwicki, who was the 1992 champion. He was flying from an appearance to the racetrack for the race weekend. His plane flew through some ice and the pilot failed to use the de-icer, and it went down. That same year, Davey Allison — who was kind of the next big thing before Jeff Gordon — died in a helicopter crash. Safety is something that I think about a lot, and something that we pay a lot of attention to. We don’t take anything for granted. We had a situation a few weeks ago where the landing gear on the plane wasn’t working right. We couldn’t take off. I had to steal a ride to Detroit on someone else’s plane to make an appearance that I couldn’t be late for. Joey Meier, the spotter for the No. 2 team, is great at his job. But one of the other reasons I hired him was because he is a pilot, too. He flies my plane. That makes for some interesting post-race conversations. Once we get to altitude and level out, we probably have a good 30 to 40 minutes to talk, and kind of air out any thoughts or issues that might have come up during the race. Needless to say, we try not to get too heated during those conversations. Michael Ribas, who does PR for the team, is usually with me, and Paige and our baby daughter, Scarlett, too. I usually bring one or two other people — maybe a couple people from the team, or other drivers who are catching a ride. 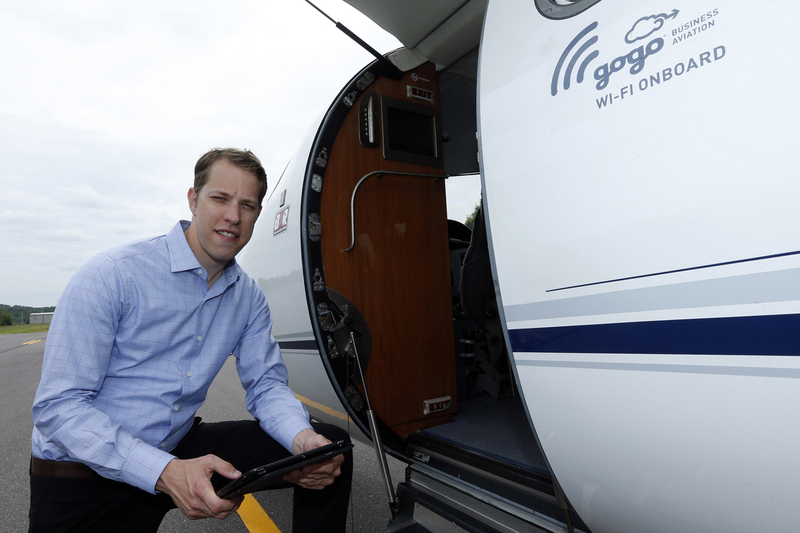 I RECENTLY PARTNERED WITH GOGO TO PUT WIFI ON MY PLANE, SO MY NEXT TWEET MIGHT COME FROM A MILE HIGH (©NKP, MATTHEW T. THACKER). As far as the flights go, we spend our time doing the same stuff everybody does on an airplane: reading, playing video games, watching a movie. Not long ago, I partnered up with Gogo to put WiFi on my plane, so I’ve started fooling around with Twitter from the plane as well. It’s kind of hard to overstate how much time we save by using our own planes. In a racing season, our haulers cover around 150,000 miles on the ground going from track to track. Add in all of my appearances, and we’re easily doing way more than that in the air. NASCAR tracks are always in very rural areas, so we typically fly out of small airports — otherwise, you’d be a two-hour drive from the closest major airport. Add in the time it takes to check in and so forth for a commercial flight, and we’re probably saving four or five hours every trip we take. When you consider that we take about 125 flights a year, that’s a minimum of 500 hours of time we’re saving. The bottom line is that NASCAR drivers try to be very accessible. Private air travel allows me to do that. It lets me be at the racetrack on time so that I can be there for the media. It helps me to get to more of our sponsor events, which is good for our team and for the sport. And ultimately, it lets me be at more appearances for our fans. Sure, it’s a win for the drivers, but everyone else is winning, too.